Fabulous looking dress that I bought in sample sale June 2018 but don't get to wear as I since found out I'm pregnant ☺ so have to purchase another. 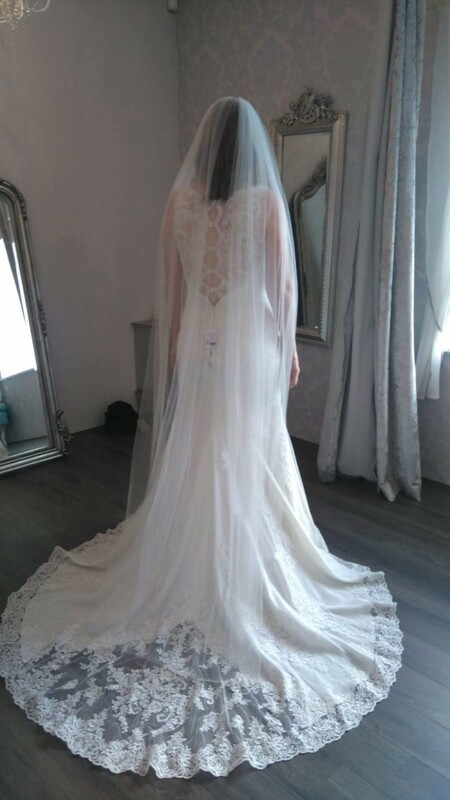 Photos are me from back (with veil) others are from essence website. Description from website about dress: Lace over matte-side lustre satin in a modified A-line silhouette is complemented by soft sequin sparkle and floral patterned lace. The kissing scallop back with illusion lace is accented by delicate pearl buttons creating a truly unique style. An elegant train is finished by a wide lace trim and features an extraordinary cut-out that brings attention to the dramatic details of the lace – perfect for a fairytale exit! Once you send a message, Finola can invite you to purchase the dress.